" As the year draws to a close I would like to take this opportunity to thank you for your continued support for the Chamber and your fellow members. It has been quite a tumultuous year for businesses; however, we continue to push ahead and weather the storms together. The year has been defined by the passing of His Majesty King Bhumibol Adulyadej, a deeply saddening occasion that we share with the Thai people. As a Chamber we recognise the enormous contribution the late King made to his country and the impact of his passing on the Thai people. We also welcome His Majesty King Maha Vajiralongkorn Bodindradebayavarangkun to the throne and wish him the wisdom and strength to build upon the good works of King Bhumibol Adulyadej. Throughout 2016 your Chamber has continued to represent the interests of our members. While not always visible to our members, our advocacy committee has worked tirelessly with various Thai ministries and the Board of Trade to highlight the opportunities and lessen the challenges we all face. Trade barriers, education, duties and excise, customs policy and regional distribution have all been on the agenda this year, and were highlighted as key themes in our Thailand and ASEAN business surveys. Where possible we have coordinated our efforts with the Australian Embassy and we are thankful for their continued support. A major role of your Chamber is to provide you with opportunities to network and build all-important relationships. Our Sundowners remains an unrivaled monthly networking event, and this year we augmented this with the return of the Australia Day Ball and the Alumni Annual Awards. Along with the numerous business briefings, we hope that you noticed the increase in networking opportunities through 2016. Of course we couldn't do this without the support of our sponsors who provided such sterling support during a difficult year. Whether hoteliers, food suppliers or members who stump up the hard dollars, we extend our thanks and I ask you support them in every way possible. It is through the support from our members that we can continue to attract such great sponsors. Together with our sponsors, our members are our greatest benefactors and we continue to see new membership applications coming to us directly as a result of your referrals. Member referrals are the best endorsement of the value we strive to bring as your Chamber, and they are a significant support to our other marketing efforts. Please do continue! Finally, the Chamber continued its commitment to the community through 2016. You should have recently received a survey identifying worthy charities that the Chamber will fund or support in other ways. All are worthy projects and have an Australian element that we can be proud of. Australians globally have an exemplary record in CSR and we are sure there are many Australian companies and expatriates in Thailand who are doing more than we know. These efforts deserve to be highlighted in our various publications and assets, and the Chamber would like to hear what you or your companies are doing in terms of CSR. The Board of Directors of AustCham are continually working to make the Chamber relevant to you, particularly during this difficult time. We are always open to your thoughts and recommendations, and I encourage you to let us know directly how we can make your Chamber better. On behalf of my Directors and our small team of busy staff at the Chamber’s office, I would like to wish you and your family a joyous Christmas and New Year, and our best wishes for 2017. " AustCham Thailand in partnership with CANCHAM, BCCT, BeluThai, EABC, MTCC, STCC and THTA invites you to Joint Chamber Crystal Ball Business Luncheon - The Year Ahead hosted by Canadian Thai Chamber of Commerce. The event promises to be a lively interactive discussion with lots of opportunities to share your own insights and ideas amongst peers in the business sectors. AustCham Thailand, together with the South African - Thai Chamber of Commerce (SATCC) and the New Zealand-Thai Chamber of Commerce (NZTCC), take great pleasure in inviting you to Vinarco Tri-Nations Annual 'Braai & BBQ' on Wednesday 18 January 2017 from 18.00-21.00. Chiang Mai will host a three day international fair between 27 – 29 January 2017. The fair will include an opportunity to showcase Australian products in a dedicated exhibition space. Interested members should contact the Chamber Office for further details. AustCham presents Australia Ball 1977, Saturday 28 January 2017, at the Grand Hyatt Erawan Bangkok. Designed and consistently developed by renowned CG experts of Thai IOD, the certification program focuses on enhancing the performance of directors through precise understanding of their duties and responsibilities. The course has also been certified by Australia Institute of Company Directors (AICD) for over 10 years. Members and guests are cordially invited to the first Bangkok Sundowners of 2017 – our signature monthly business networking function which will be held at the boutique and chic Mode Sathorn Hotel; a few seconds walk from Surasak BTS skytrain. As 2016 wraps up, Google has announced its annual “Year In Search,” a look back through the year’s major events and freakiest trends in Thailand based on what its residents searched for most often. If anything encapsulates our complex, uncertain, uncooperative world in 2016, it’s trade. For decades seen as a powerful force for good – enhancing growth, competitiveness and living standards – trade made greater integration within the global economy seem more or less inevitable. The National Food Institute (NFI) says it plans to push Thailand to be among the top five food exporters within the next 20 years, with value rising to 6 trillion baht, says Nuttapon Nimmanphatcharin, the institute's vice-president. Nearly 90% of Thai people will join New Year activities, the same proportion as last year, despite the impact from the mourning period and the sluggish economy, says Nielsen Thailand. The Board of Investment expects to open an overseas office in Yangon early next year, as part of its strategy to promote Thai investment in Myanmar and the rest of Asean. Thailand's parliament passed legislation amending a cyber crime law on Friday, which rights groups have criticized as likely to lead to more extensive online monitoring by the state. This year our members helped AustCham raise funds in excess of 500,000THB for our CSR program. At the 2016 Australia Ball we provided more than 100,000THB to the Fred Hollows Foundation and, once again this year, we surveyed members to identify which causes will receive the remaining funds. Brenton Mauriello recently attended a Mexican Chamber of Commerce event for a visiting Mexican Minister and an Australian Alumni event hosted by the Australian Embassy in Chiang Mai. The appointment of an Australian Honorary Consul (Designate) in Chiang Mai is anticipated to improve business engagement in the north of Thailand starting with today’s Upcoming Events which includes information on promotional opportunities being offered to members at the Chiang Mai World Fair in late January 2017. Alan Polivnick has also recently met with the FTCC to discuss cross Chamber collaboration on CSR initiatives in 2017. 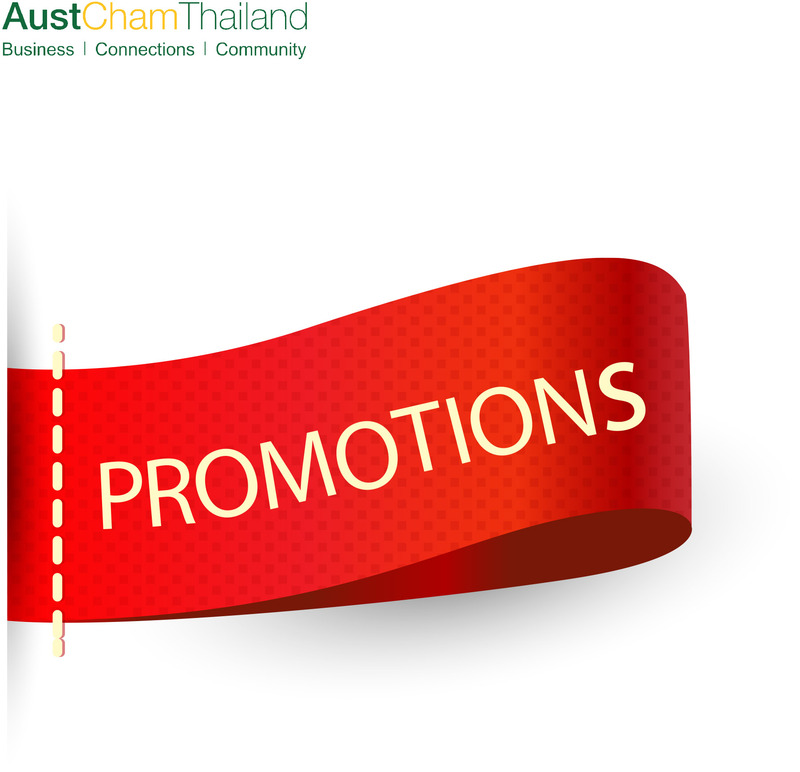 This Festive Season in Thailand - a summary of promotional offers! This year, AustCham has compiled the festive offers extended by members in one easy to read list! Looking for Christmas lunch options? Thinking about a festive stay-cation? New Member - TCC Hotel Asset Management Co., Ltd.
TCC Hotel Management is a member of TCC Group, one of Thailand prominent conglomerates. Our core business is to develop and to invest in wide range of real estate projects covering residential, hospitality, retails, property management, logistics, and agro industries in Thailand and worldwide. Rugby School Thailand’s link with Rugby School in the UK provides us with access to 450 years of educational and pastoral heritage. And Rugby School has recognised, more than any other UK school, that modern education is about ‘the whole person’ – mind, body and spirit, all connected. New Member - Air Radiators (Thailand) Ltd.
Air Radiators is a world-class business committed to the design and manufacture of innovative heat transfer and air movement solutions in partnership with our customers.